It is not from the benevolence of the butcher, the brewer, or the baker, that we expect our dinner, but from their regard for their own self-interest. We address ourselves, not to their humanity but to their self-love and never talk to them of our own necessities but of their advantages. It is a common human belief to think that somebody is “in charge” – to believe that everything happens because somebody, somewhere made the decision. When we were children, of course, this belief was natural. After all, most things in our lives were decided by our parents, our teachers, or some other “grown-up” authority figure. As adults, it is common to continue to believe that somebody is (or at least ought to be) “in charge” and making the decisions. Often it is the government or the head of some major corporation that we think is responsible for “how things are”. And, it is true in most social institutions. Any government has a people who are “in charge” and make the decisions. Corporations and large organizations have a boss or CEO. Any army has a commanding general. Even football and hockey teams have captains and head coaches. But a market, one of the most common and oldest social institutions we have, doesn’t have a boss. In a free, competitive market, nobody is “in charge”. This search for somebody to “be in charge” is what makes free markets difficult for some people to understand. No single authority decides how much of a product (the quantity) will be sold and purchased in a free, competitive market. No single authority decides what the price for that product will be in a free, competitive market. Instead, the quantity sold & purchased and the price simply happen as the result of a large number of people all making independent, self-interested decisions. At first glance, it seems like a market should be utter chaos with no reason to think anything positive will result. After all, there’s all these people thinking only about “what’s good for me” and nobody is “in charge” to make sure these many different decisions are coordinated and that there’s no waste. Yet, in reality, just the opposite occurs. A free, competitive market will not only result in an orderly coordination of decisions, but the results will be the most efficient outcomes possible. Economists sometimes describe this phenomena as “emergent order”. From what looks like it should chaos, order actually emerges. And not just any order, the most efficient order possible. So, if nobody’s “in charge”, how does the price and quantity sold/purchased get determined in a market? The story of how price and quantities get determined in a market is the story of demand and supply. The story of supply and demand (it makes no difference what order we say it), is powerfully communicated using a graphical model. This supply and demand model is what we are going to study in this unit. It’s THE foundation of all economists analyses of markets, including markets that don’t work so well. We will begin the chapter by studying and defining demand and supply separately. Then we combine them into a single model/graph and use it to determine the price and quantity sold/purchased. Finally, we will examine what happens when government decides it knows better than the market and the government decides to intervene and limit what prices or quantities can be sold/purchased. Explain how supply and demand interact to determine the price and quantity sold of a product by using graphs and numerical examples. Use supply and demand analysis to show and explain how a market changes as a result of a hypothetical event or an event in the news. Explain (and illustrate with a graph) the effects of a government action preventing a market price from moving to equilibrium. 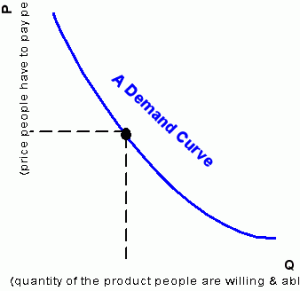 A demand curve looks like a relatively simple line: it is simply a downward-sloping curve drawn on a graph. The demand curve, and it’s shape, represent what economists call The Law of Demand. Of course, it’s not actually a legal law. It’s a regular relationship that is so predictable, so common that we call it a law, just like how physicists refer to the “law of gravity”. In short, the Law of Demand states that for any particular good, the higher the price, the smaller the quantity people will be willing and able to buy, other things being equal. That’s actually a very loaded statement. There’s a lot being said there. Likewise, the simple downward-sloping demand curve that represents this statement on a graph is also loaded with lots of information and conditions. A lot of later trouble in understanding can be prevented by spending a moment to really fix in our minds what is represented by a demand curve, such as the one to the right. First, the space we are dealing with now is different from what the PPF model used. In this space, the two axes are Quantity and Price. The horizontal axis represents a quantity of the particular good in question in units. It doesn’t really matter what units we use, as long as it’s relevant and consistent. If the good were “soft drinks”, then the Q axis could be “ounces of soft drink” or “bottles” or even “cases”. The vertical axis is the price that is charged in the market for each unit of the quantity axis. In the U.S., of course, this is usually represented as “dollars per unit”. Each point in this space then represents a possible quantity sold at a particular price. It should make sense now why in economics we only use the upper-right quadrant of the x-y coordinate space. Points in other quadrants wouldn’t make sense: they would use negative numbers and wouldn’t have any economic meaning. We can’t easily charge a “negative price”, just like we can’t purchase a “negative quantity” of a good. 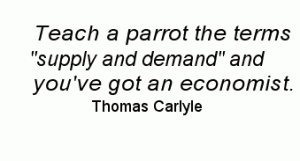 The demand curve itself represents the limits of what the consumer (purchaser) will pay. Any point on the demand curve corresponds to a specific quantity of the good AT a specific price. For any particular quantity, you go up to the demand curve and the corresponding price represents the highest price the purchaser will pay and still be willing to buy that quantity. Similarly, we can go out from any particular price to the demand curve, drop down and find the maximum quantity the purchaser is willing to buy at that price. This means that the demand curve is really dividing the space of all the possible price-quantity combinations into two regions: the price-quantity combinations the purchaser is willing and able to buy, and the price-quantity combinations the purchaser is not willing or able to buy. This is illustrated in the graph to the left. Let’s suppose you go to the store shopping. You have an idea of what particular product you want, but you don’t know the price you’ll have to pay. Since you don’t know the price, you don’t know how many units you’ll buy. After all, if it’s a really high price that is being charged, you can only buy a very few units or perhaps only buy one unit, or not even buy any at all. That’s because at a high price, your limited budget will only allow to buy one or a few units (…able to buy). In addition, at a high price, you’ll probably conclude that there are other products you could spend your money on and get much better value or “bang for your buck” (willing to buy…). Of course in reality you most likely rely simply on your gut reaction to the price when you see it to determine whether it’s worthwhile or not, and how many units to buy at that price. But let’s suppose you sat down before entering the store and made a list of all the possible prices you might see inside the store. Then, for each price you listed the maximum number of units you would be willing and able to buy at that price. You would then have what we call a demand schedule. If you plot the price-quantity combinations you listed, you would have demand curve. Of course, you aren’t the only person in the store or in the market. Many other people are shopping too. Some of them have bigger budgets and some have smaller budgets than you. Others don’t share your tastes either and might like the product. Together, all the shoppers make up what we call market demand. Market demand is simply adding up, for each possible price, the total quantity that could be sold to all shoppers together with each shopper making their own buy-no buy decision. Plot the totals for the market demand schedule and you have a market demand curve. Demand, then, is the relationship between price and quantity purchased that emerges from a buyer’s willingness and ability to buy. Of course, our willingness to buy sometimes changes. Our ability to buy definitely changes over time. The demand curve represents the willingness and ability to buy at a particular point in time and given a particular set of conditions or circumstances. When these other conditions or circumstances change, then the demand curve moves or “shifts”. We typically think of demand curves shifting horizontally to the left or to the right, depending upon what condition or circumstance has changed. What kinds of conditions or circumstances change/shift a demand curve? Many things can happen that would change your willingness to buy a particular product. To simplify things, though, economists classify all these many different changes into four types: changes in income, tastes, alternatives, and expectations. Typically the most important type of change in your alternatives is a change in the prices of other goods. Any change in one of these four factors will shift a demand curve to the left or to the right. Suppose you repeat the shopping trip we imagined above, but this time your boss has just given you a very significant raise – an increase in your income. For most goods and products, you are now more willing to buy a larger quantity of the good in question because you can afford more. Your demand curve shifts towards the right on the graph. Any particular price now results in a larger quantity number. A shift rightward is called an “increase in demand”. This would be the normal reaction for most goods when we get more income to spend, and thus we call such goods normal goods. There are, however, some goods that we are less willing to buy when we get a higher income. For example, Ramen Noodles, using a coin laundromat instead of owning your own washer, or buying a used car instead of a new one. These goods are called inferior goods. It’s not that economists think the products are inferior, it’s that people demonstrate that when their incomes go up, they would rather buy other, more desirable goods. The prices of other products also affect how willing you are to shell out good money for this particular product. When the prices of other products change, it will shift your demand for this product. When the price of chicken goes up, you’re more willing to buy beef. Your demand curve for beef shifts to the right because beef and chicken are considered substitutes. You’re willing to substitute beef for the chicken that is now more expensive. Not all products are substitutes for each other. For example, hot dogs and hot dog buns are complements. Purchasers want to consume complements together as a “package deal”, so when the price of hot dogs goes up, it makes you less willing to buy the buns. After all, a higher price on hot dogs causes you to buy fewer hot dogs. Since you are buying fewer hot dogs, your need for the buns is reduced. Your demand curve for hot dog buns shifts to left, or decreases. Similar shifts in demand curves can be caused because people’s tastes or expectations have changed. Economists use the word tastes to cover all our feelings about the usefulness, fashionability, attractiveness, or image of the product. TIP: Make sure you understand the difference between a “change in demand” and a “change in quantity demanded”. A change in demand means the demand curve has shifted because some condition such as income, tastes, prices of other products, or expectations has changed. A change in quantity demanded is simply a movement from one point on the demand to curve to another point on the demand curve as a result of the price of this good changing. Once you know how the demand curve works and what it represents, the supply curve and what it represents is fairly easy. Graphically, of course, the key difference is that the supply curve slopes upward while the demand curve slopes downward. Economically, though, the supply curve represents the willingness and ability to supply quantities of the good to the market at different prices. The supply curve represents the Law of Supply which says that the price and the quantity supplied to the market by sellers is directly (positively) related. In other words, at higher prices sellers will be willing and able to produce and sell more units. At very low prices, sellers are not able to produce and sell as many units. Typically at this point in the course, students’ greatest problem with the supply curve (or the Law of Supply) is understanding intuitively why the curve slopes upward. Many of us have had the experience where if you buy a larger quantity, the seller will give you a discount. Such a situation isn’t really a good test of the “correctness” of the supply curve. The supply curve we’re interested in here is the market supply curve: the sum of the willingness of all potential producers to sell. There is a phenomenon called diminishing marginal returns that causes the supply curve to slope upwards. We will examine the diminishing marginal returns and costs in closer detail in a later unit. At this point, it’s important to accept that the supply curve does slope upward. For intuitive purposes, you can think of it as it takes higher and higher prices to get more and more people to be willing to sell their goods. Often this is because these additional sellers/producers aren’t as efficient as those who sell as lower prices. Thus, to make a profit, it takes a higher price to get more businesses to be willing to produce and sell the product. And, just as with the demand curve, we need to make the same distinction between changes in supply vs. changes in quantities supplied. A market is a group of potential buyers and sellers, all making their own independent decisions. Each has their own willingness and ability to buy or to sell at different prices. Nobody coordinates them. Remember, there is no central boss in a market. So how does a market settle in a price? Well, buyers and sellers come together and begin to explore each other’s offerings. They negotiate. They bargain. They “higgle” as Adam Smith once described it. In some markets the bargaining is obvious: two people are making verbal offers and counter-offers. In some markets, the bargaining is subtle, such as when a store puts a price on sweater on the rack. Then people come into the store, look at the sweater, check its price, and walk-out without buying it. The store then knows the price is too high for those shoppers. The store tries a lower price and then maybe some people buy. People also look around at what deals other people are making. They look at what prices are being used in real transactions. Both buyers and sellers keep making offers and changing the prices and then observing what happens. When prices stop changing the market has reached what economists call an equilibrium. When a market is at equilibrium, there is no reason for anybody, either buyer or seller, to change their offers. Nobody has a good reason to raise the price or to lower it. We can learn more about what an equilibrium is by looking at what happens when we are not at equilibrium. When prices are not at the equilibrium level, either shortages or surpluses will happen. A shortage occurs the price is too low. Draw both the market demand curve and the supply curve on the same graph. Now pick a price that’s very low (below where the two curves intersect). At this low price, sellers are only willing and able to supply a small quantity of the good. But this same low price causes buyers to want to buy a large quantity. The problem for the buyers is that there simply aren’t enough units of the good available. Some of the buyers who are willing and able to buy simply won’t buy because they can’t find units for sale. This is a shortage. When a shortage occurs, some buyers are disappointed, lines form, and waiting lists emerge. The sellers take their cue from this shortage that they can raise the price. The sellers raise the price. Some of the disappointed buyers offer to pay a higher price just to get the product. As a result, the market price (the actual price of transactions) begins to rise. Eventually the price may get too high. After all, no “boss” exists to tell everybody what is the “right” price. What happens when price is too high? A surplus exists. A surplus means that the producers are making too much. The high price causes businesses to produce a large quantity and offer it for sale. Yet the high price also sends the signal to buyers that they don’t want to buy very much. High prices cause buyers to buy small quantities. Some of the units produced get sold, but much of what was produced doesn’t sell at the high price. It sits there on store shelves. And what do stores do when they have too much of a product on hand? They run a sale! They mark-down prices. The lower prices cause more buyers to be willing to buy some more. The lower prices also cause some sellers to give up and quit making as many units. The pressure of unsold goods (surplus) forces market prices down. The only price where there is no pressure on the price to go up (to eliminate shortage) or to go down (to eliminate surplus) is the equilibrium price. Graphically, it is where the market demand and market supply curves intersect. “X” marks the spot. Formally speaking, a market equilibrium exists where the price results in quantity demanded being equal to quantity supplied. Take a moment to consider this what’s happening in a market at equilibrium. Without any central direction or management, a large group of buyers and sellers have all made independent decisions about their needs and their willingness to buy or sell. They then negotiate with each other. Each buyer and seller is free to say yes or no to any proposed price or deal. Yet what emerges eventually is an equilibrium where the quantity that businesses produce is exactly the quantity that buyers want to buy. No extra or unnecessary units get produced. Likewise, everybody who wants to buy at the market price gets to buy what they want. No disappointed “would-be” buyers. No surplus. No shortage. The buyers got what they wanted. The sellers got what they wanted. Perfect coordination. This is the “invisible hand” that Adam Smith famously described as coordinating buyers and sellers. Of course, just because there is no shortage or surplus doesn’t mean everybody is happy with the outcome of the market. Sometimes politicians think the results of the market are “unfair” by an equity standard. Sometimes buyers may have gotten all the units they wanted at the market price, but of course they would love it if they could get even more units at a lower price. But they can’t get more units at a lower price unless sellers are forced (coerced) to do something they are voluntarily unwilling to produce. Likewise, sellers would love to charge a higher price and still sell the same quantity, but they can’t do that unless somebody forces buyers to pay more than buyers are voluntarily willing to do. Sometimes sellers or buyers are able to get the government to force the market to change. A government has the power to limit the prices that can be legally charged or the maximum quantities that can be sold. When a government interferes with a market and sets a minimum legal price, it is called a price floor. Price floors below the equilibrium price are meaningless. It’s like saying you can’t sell a new automobile for less than $2.00. But if a price floor is above the equilibrium, then government price floor causes a surplus in the market. Similarly, when the government sets a maximum legal price it is called a price ceiling. A price ceiling above equilibrium is irrelevant (do the graph). But a price ceiling that is below equilibrium will create a shortage in the market. When shortages or surpluses occur, other social mechanisms emerge to help ration the goods (deal with shortage) or to get rid of the actual surplus. At times, governments attempt to disguise their interventions in the marketplace. Instead of outright limiting prices by law with a ceiling or floor, the government may attempt to either establish a quota or a price support. A price support is a disguised price floor. With a price support, the government promises to use tax money buy up additional units in the open market until they force the market price up to where the price floor would be. Of course the government has no need of the product itself and often has to then spend more money to get rid of the product they have purchased. In a quota, the government typically licenses a limited number of suppliers on the condition that they limit how many units they supply to the market. Graphically this is an artificial forcing of the market supply curve to the left (reduced supply). Then government lets the market reach an “equilibrium”. The resulting supply-restricted equilibrium has a higher price and lower quantity than what would have happened without the quotas. There are indeed times when a free, competitive market may not function well socially. Usually such “market failures” involve issues such as public goods or externalities like pollution. In such cases it is necessary to have government interfere with the prices and quantities in the market. 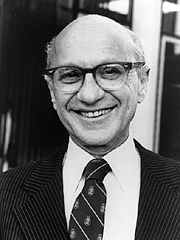 However, the record of governments everywhere throughout history has been a tendency to interfere with free markets in many cases where there is no need. The result is inevitably shortages or surpluses, and often higher prices and less goods for consumers. We’ve seen in this unit how a simple demand curve shows how Quantity Demanded changes when Price changes. But some demand curves are steep and others nearly flat. In the next unit, we look closely at how sensitive the quantity is to changes in price. We will examine why people are more price sensitive for some products than for others. We will discover a way to measure this sensitivity. Finally, we will see how a business that wants to collect more money can determine whether they should raise the price or lower it.